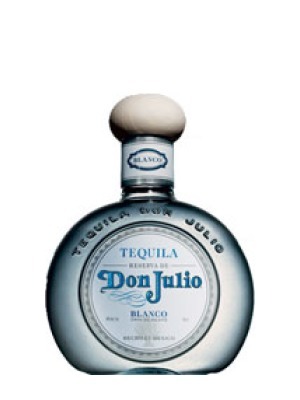 Don Julio Blanco Mexican Silver Tequila is a popular Tequlia available from Amazon.co.uk in 70cl to buy online. Visit Amazon.co.uk for the best price for 70cl of Don Julio Blanco Mexican Silver Tequila or compare prices on our other Tequlia products. With a fresh agave expression and citrus notes, this tequila is called upon often when concocting innovative cocktails and the ultimate margarita, but is also perfect on its own or on the rocks. This Blanco was given a 'Classic' rating in Wine Enthusiast Magazine's review of the top spirits of 2007. 'Classic' is their highest recommendation and was awarded after noted critic Paul Pacult reviewed over 250 spirits. Colour: Clear. Nose: Crisp Agave aromas blended with hints of fresh citrus notes - lemon, lime and grapefruit. Taste: A lightly sweet and incredibly pure agave flavour immediately excites the palate and rounds out for a smooth and lush Blanco tequila of unrivalled excellence. Finish: Clean and fresh complemented by a touch of black pepper and grassy undertones. Where to buy Don Julio Blanco Mexican Silver Tequila ? Don Julio Blanco Mexican Silver Tequila Supermarkets & Stockists. You can buy Don Julio Blanco Mexican Silver Tequila online in most retailers and find it in the Tequlia aisle in supermarkets but we found the best deals online for Don Julio Blanco Mexican Silver Tequila in Amazon.co.uk, 31dover.com, DrinkSupermarket.com, TheDrinkShop, and others. Compare the current price of Don Julio Blanco Mexican Silver Tequila in 70cl size in the table of offers below. Simply click on the button to order Don Julio Blanco Mexican Silver Tequila online now.